Buffy. Is. Back. Written by Redlands’ Jordie Bellaire, drawn by Klaus’s Dan Mora and overseen by series creator Joss Whedon and the experienced editorial hand of Jeanine Schaefer, this new take on the franchise resets the clock to the Scooby Gang’s high-school years, but with more contemporary flair. Following almost a decade of additional “seasons” at longtime publisher Dark Horse Comics, this more accessible pitch stands to attract both lapsed fans and newer generations who didn’t grow up with Sarah Michelle Gellar and company. Looking at the first issue, on stands today, it’s undeniably weird to see the recognizable likenesses of the cast in sometimes dramatically different roles—but that’s half the fun, and the creative team is fully aware of how they can use that dissonance to their benefit. 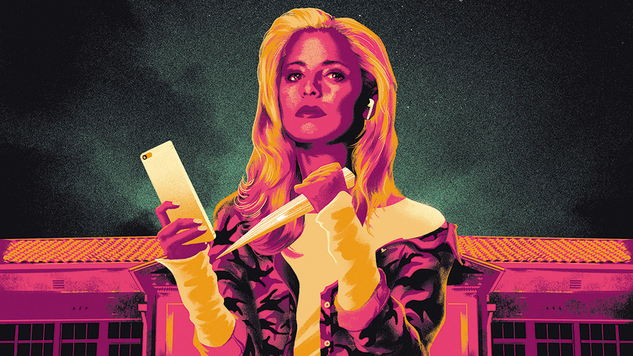 Paste recently jumped on the phone with Bellaire and Schaefer to talk about bringing Buffy into the year 2019, how the creative team plans to approach the series’ cast of characters and what to expect from this new era going forward (hint: heartbreak). Check out our interview below, along with a sneak peek at interior art from next month’s Buffy the Vampire Slayer #2. Paste: There’s a tendency with older media to think, Oh, this hasn’t aged well or Twitter would have a field day if this came out now. Did you approach this “reVamp” with a list of elements you knew you’d want to update for 2019, like Willow being queer and out from the start, or has it been a more fluid process of tweaking smaller components and seeing how that ripple spreads out? Jeanine Schaefer: We talked about what would be different if it’s 2019, and we joked around, “It’s not just ‘oh there’re cell phones and everything else is same.’” Things are very different now in terms of what teenagers are aware of, the ways that they can communicate with each other, the ease of communication, just the language that they have to talk about a wider scope of social and cultural and political issues. [And] to be super clear, I think the Buffy show is great. I still watch it. A friend of mine and I are doing a re-watch right now. And it’s awesome. I don’t think it’s aged, like in terms of the material. Sure, what they’re wearing, their hair and stuff like that is ‘90s but the stuff that we approached in terms of tweaking it or updating it wasn’t because it didn’t age well, it’s just because the social and cultural landscape for kids is so much different now that there’s just no way that things could have played out the same way. But that all just comes from the nature of the time change, not necessarily because there’s anything wrong or old or dusty about the material because that material is still so super-relevant. Which is the reason why we wanted to even do this, because the spirit of the show is still relevant today. Paste: Just from the first issue, you’ve made it pretty clear that you’re not going to be overly attached to following the source material word by word. The final three pages alone hint at big changes for Xander, Anya and Drusilla. How much free reign has Josh Whedon given BOOM! to reimagine Buffy for this new series and how do you go about deciding which character changes are just right and which would be a bit too much? Schaefer: Joss has been incredibly generous in that he read our outlines along the way, he read the super-arc that we have for the first year, and we walked him through it and he’s so excited about a lot of the changes that we called out specifically with the characters. I think that’s what he was the most concerned about, was that we were getting the characters right and being careful with them. And he was really happy with the stuff that we wanted to change and the directions we wanted to take them in and how much we wanted to push them. So like I said, he’s been really generous in terms of giving us the space to do what we want to do while still being really careful with the things that he’s really attached to. He did have a couple of requests that he made of us, some parameters that he gave us, so he could ask us some tough questions that we needed to answer in service of making sure that we were being careful with the characters and with the world. And we talked about it and were able to deliver on that. There are a couple of hints in the first issue about a big thing that he asked us to address. I’m not going to say, because I think as you guys read, you’re going to pick up more on it, but I’m happy that we were able to do that for him. Jordie Bellaire: I think like Jeanine said, this is a different time for teenagers and for young people. Assuming that all the characters would play out the same roles they would have in the ‘90s—I just think that they would have different experiences leading up to who they are now in 2019 as 16- and 17-year-olds. So I’m trying to address normative experiences that we knew for all of them before, but maybe reversing it. Especially with a character like Dru, she’s showing up in a very different way. Rather than being a victim of weakness and a victim of circumstance, I have her sort of owning her bad villain side a little more confidently and she’s a little more arrogant and I’m very excited to embrace her and things like that. And also within the Scooby Gang, there’s going to be some massive—I would say character changes—because again, I just think they would be different people in 2019. The last 16 years would have just made them a little bit different, just not what you expect them to be from before. Not to say I’m going to change them completely. [Laughs] Xander is still a goofball, Willow is still extremely book-smart and friendly, and I think Buffy is still a badass lady, very angsty. But yeah, there’s going to be some subtle changes to the arcs for sure. Paste: Buffy helped establish the Whedon-esque school of dialogue patter and quips. Jordie, has it been challenging to slide into these character voices and adapt them for the modern day? And has any character emerged as a surprise favorite for you to script? Bellaire: Oh that’s interesting. To be honest I really enjoy writing Xander. I didn’t know if I was going to be able to write Xander but he’s one of my biggest pleasures to write. I think that, because I’m 30 now, I grew up right in the right area of the Whedon-verse, seeing Firefly for the first time, getting to see Serenity a few times in theaters and also just loving Buffy when I was quite young. It’s been really informative, I think, to my voice as a writer because I looked up to Joss’s writing and all the writers-room work in that show. I’m in no way saying I think I’m at the status of those writers in those rooms, those people are titans of comedy and drama, they’re amazing. But I am happy to say that for me, it feels like a great pleasure to write because I really think they’ve informed who I am as a writer, those shows. So hopefully that shows to readers as well. Paste: While we’re talking about your writing approach, this first issue doesn’t really brush against witchcraft, but Willow’s magic use played a huge part in the original series. Has your experience with Redlands influenced how you’re approaching witchcraft and demonic women in Buffy? Bellaire: How could it not? [Laughs] They’re my favorite, demonic women. Women who are arrogant, women who make bad decisions, with or without magic. Yeah, it’s definitely going to play a part in how I look at things. But it’s nice because in this story, I feel like I’m going to obviously have to bring it to an age-appropriate level. It’s sort of like going through the lens of a 16-year-old girl and how they would use magic and maybe even sexuality and things like that in comparison to how Redlands is formed, which is deeply adult and deeply mature. It’s definitely something—it’s my jam. I don’t know how to put it. It’s just my jam to write, the mythos of women being these strong creatures, but if they were magical or powerful—when I say magical, I guess I mean that loosely—men called them demons if they had power, if they were tough, if they were wealthy. There was no excuse that they actually earned those things but that it must be the work of the devil. So I definitely think that’s a theme that I’m really going to bring into play, maybe with people resenting women a little bit in the Buffy-verse because they do have all these extraordinary skills. Schaefer: I don’t want to step on the answer at all but I need to jump in and say, reading Redlands was why I asked Jordie to write this book. That was everything that I like about women and talking about women and witchcraft and positions of power and the different terminology that we use for that depending on how we view them and the lens through which we view them. I was like, “This is what I want. This is what I want everything to be about.” I read it and it spoke to me on such a deep level, like there is no one else for this, this is it. Bellaire: Aww, Jeanine. Thank you. Schaefer: It’s true! It’s just true. Schaefer: I think too, teenagers see themselves as adults, right? They definitely don’t think of themselves as kids, they think of themselves as worldly and wise, and I think that’s what I saw too, taking this story and layering it with, from the teenagers point of view, like they’re dealing with all these adult [problems]. It just made so much sense to me. Paste: So far, aside from the variant covers with historical slayers, we’ve only seen familiar faces, even if some of them are in reimagined contexts. Will any totally new characters become a big part of Buffy going forward, or should we expect the initial arcs to stick close to the live-action cast? Schaefer: We’ve definitely going to be expanding the universe with some new faces and exploring some new parts of the universe. I think that’s part of the fun of this too, is we get this dramatic irony of all these characters that we know, we can bring them in earlier, we can bring them in later, we can put spins on them, we can add new pieces of the cast because we kind of know how the puzzle pieces could fit, so we can do some rearranging in advance, if that makes sense. Paste: That dovetails with my next question. How big does BOOM! plan to go with the Buffy license? Is this something that you hope to see become a family of titles with time, or will we be sticking with one series for the foreseeable future? Schaefer: Right now, we want to give Buffy the room to breathe and to build her up, but we do have a robust publishing plan moving forward, so we’ll definitely see some expansion of the universe moving forward. Paste: I of course want to know what it’s like collaborating with Dan Mora for this series. Buffy feels like the perfect blend between his Power Rangers work with younger characters and the crazy imaginative Klaus stuff he does every winter. What’s he bringing to Sunnydale and what’s it like working with him? Bellaire: Jeanine hired him, so Jeanine made the best call in the universe, I think. Dan is an extraordinarily kinetic, energetic, just brilliant artist. I’m jealous of how good and easy he makes it look. When I wrote my script, I was so blown away by just how much immediate life they had, and that it felt like a Buffy universe because he just nails those likenesses, he nails that comedy, he nails those beats, he’s so good with his action sequences. So I just had to get in as the writer person and say I’m blown away by Dan. I think Dan is an incredible talent and I’m very humbled that we have him on the book because he’s making me look really good. Paste: Well thank you both so much. Is there anything else you want to say to Buffy fans before we part? Bellaire: I’d like to say… come for the slaying and stay for the heartbreak. I love breaking hearts and I think Joss Whedon loves breaking hearts too. [Laughs] So I hope everyone’s ready for that. I always liked that, actually. For the longest time, people were like, How dare Joss Whedon break everyone’s heart with every show he’s ever done? He’s got things going great for him, but he’s constantly breaking hearts. And it’s true. Joss Whedon is a very cruel man. He just likes to break all of our hearts. I’m going to try to follow in those footsteps if I can. Paste: What an ominous note to end on. Schaefer: No way. You know I love putting our favorites through pain.